Martin Swiss played at home against Simon and Oil. Martin Swiss team had a difficult evening against Simon and Oil, who were playing very well. The beer leg was a three-setter and won by Simon and Oil who also the match with a 8-4 score. Champs played at home against Ting Tong. Dilly and Mick both playing for Ting Tong had a good performance and both won their singles and doubles games. Ting Tong was leading 5-4 before the beer leg, but Champs came back strongly and won the beer leg in two sets and the match 6-5. Anna playing for Champs is the new star of the team and brought the second victory for the team this season. 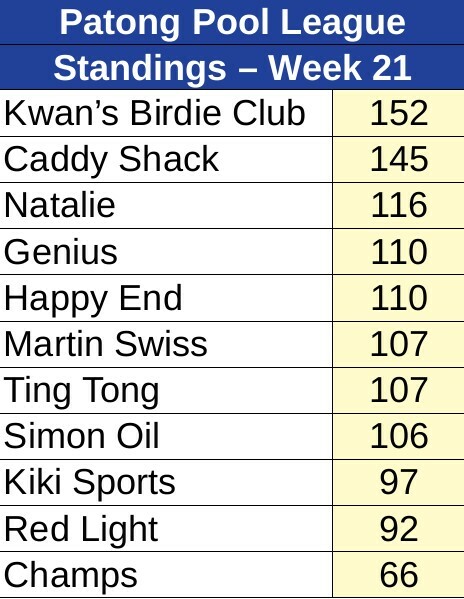 Kiki Sports bar played at home against Kwan’s Birdie Team. The Birdie Team was looking for a big win to take the lead in PPL this season. Mike and Goh playing for Birdie both won their singles and doubles games. The beer leg was a three-setter and won by Birdie, who also won the match with a 9-3 victory and finally took the lead before the last match of this season. Genius played at home against Natalie bar. Poy and Rat playing for Genius both won their singles and doubles games. The beer leg was a three-setter and won by Natalie bar but the match was won by Genius 7-5 . Happy End bar played away against Red Light bar. Team captain Jerry playing for Happy End after many months of absence won his singles and doubles games, but so did Kevin playing for Red Light after his return from his Bali trip. Happy End’s talented Swedish player Patrik had a good win against Red Light owner Gwen. The beer leg was a three-setter and won by Happy End, who also won the match 7-5. 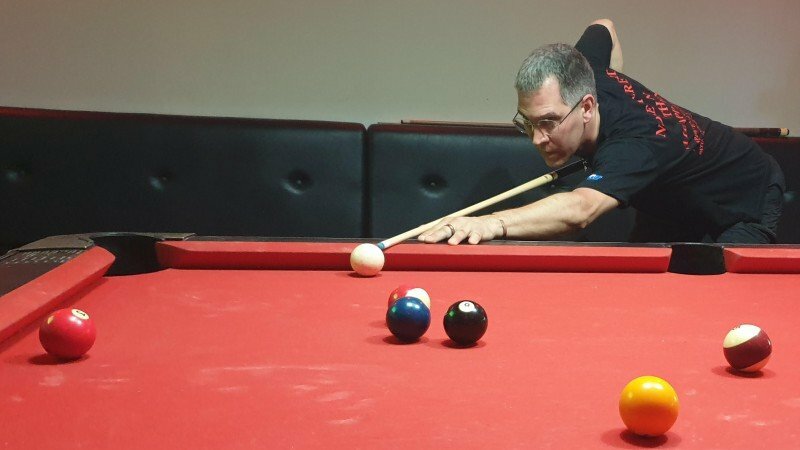 The 22nd round of the Patong Pool League will be played this Thursday (Apr 18). The End of the Season Party will be held at Genius 2 Garden and Restaurant on Apr 25. People interested in playing as well as visitors are all welcome to attend at one of the 11 participating bars. You can also visit the Patong Friendly Pool League Facebook page.